An Iron Butterfly is a Butterfly Spread Credit Strategy where a Short At The Money put and call are sold plus an Out Of The Money Long Put and and Long Call. 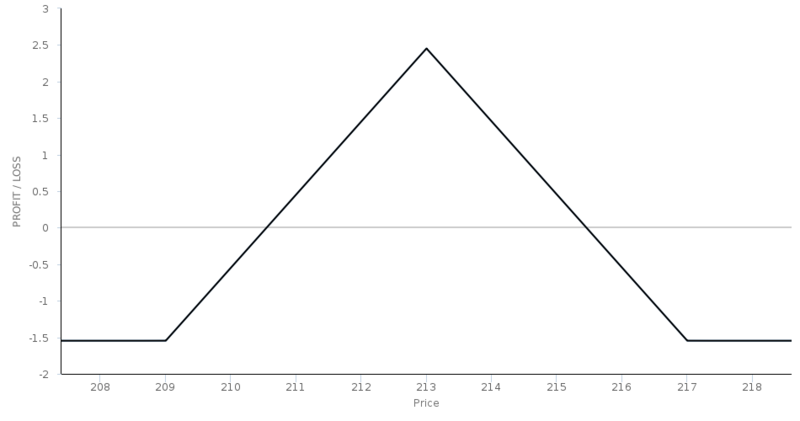 An Iron Butterfly is equivalent to selling a Straddle and buying a Strangle (and is therefore considerably lower risk than a Short Straddle). This strategy is non-directional and Volatility Bearish. The sale of the two At The Money call and put Options for more than the two protective Long Options generates a credit, in this respect, Iron Butterflies have some similarity with Iron Condors (which are two Out Of The Money put and call credit Spreads). Video by Dan Sheridan explaining the mechanics of trading an Iron Butterfly using SPX index options. A Tradeking Options Playbook article describing the options that an Iron Butterfly is composed of and its general characteristics. OIC article on Iron Butterflies. 3 Joys of a SPX Weekly Iron Butterfly? Dan Sheridan explains how to implement weekly Iron Butterflies as income generating options trades in this CBOE Options Hub article.